The ancient city is an extraordinary place, full of history. Each chapter of Chester's history is etched into the very fabric of the city. Well, you are walking where Roman Legionaires marched to war, Viking raiders wreaked havoc and Norman invaders conquered Anglo Saxons. Chester has the most complete city walls, the oldest racecourse and the largest Roman Amphitheatre in Britain, plus a 1000 year old Cathedral with Europe's finest example of medieval carvings - and of course the one and only 700 year old Rows galleries full of interesting shops. Crowning a rocky crag and boasting spectacular views, Beeston is one of the most dramatically sited medieval castles in England. On a clear day you can see all the way from the Pennines to the Welsh mountains. With a 4,000 year history and a 40-acre woodland park surrounding it. Situated on the banks of the River Weaver, Nantwich is famous for the medieval timbered buildings dotted around the town. Stroll through the atmospheric streets and visit for bijoux boutiques, antiques dealers and contemporary craft shops, and visit the beautiful and peaceful St Mary's church in the heart of the town. Englesea Brook is a peaceful hamlet, with easy access from the M6, which seems a world away! Our early Primitive Methodist Chapel was built in 1828, and has box pews in the gallery. Hugh Bourne’s Memorial School, built in 1914, houses the Museum of Primitive Methodism, which attracts visitors from all over the world. A short diversion from the route on entering Stoke-on-Trent will take you to Middleport Pottery, the home of world-famous Burleigh. See pottery produced over the years and step into the iconic bottle kiln in our visitor centre. Afterwards, relax in the tearoom which overlooks the Trent and Mersey Canal before resuming your walk. The museum is joint owner of the Staffordshire Hoard which was buried at the time in which St Chad and St Werburgh lived. This fascinating exhibition sets pieces from the world-famous Staffordshire Hoard in context among items from our collection of Anglo-Saxon finds, many never displayed before, and offers a glimpse into our ancestors’ lives. The display features a raised wooden-floored mead hall, with columns and banners adorned with Anglo-Saxon artwork– representing ancient designs on the Hoard artefacts – along with a replica fire pit and king’s chair. 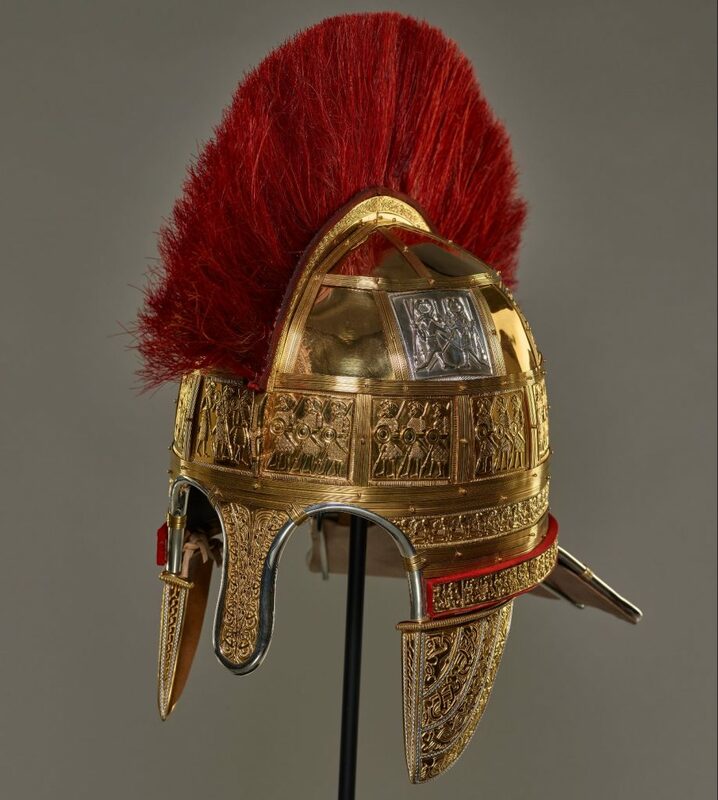 Research reveals approximately a third of the fragments in the Staffordshire Hoard come from a very high-status helmet. One of the two reconstructions of the helmet is on display. A church has stood on the site of Stoke Minster since the 8th Century. Midpoint on the Two Saints Way the church hosts a number of interesting features, including the grave of Josiah Wedgwood, along with the remains of a Saxon preaching cross. Legend tells that the Anglo-Saxon origins of the town of Stone are told in these fine iron railings at the end of its High Street - telling the story of Rufin and Wulfad, who were killed by their father King Wulfhere for converting to Christianity. Their mother buried them under a cairn of stones nearby - and so the town came to be called 'Stone'. The ancient High House is a Stafford landmark, located on Greengate Street, amid modern shops. But there is nothing modern about this attractive timber-framed house. It was built around 1595 and is generally considered England's largest surviving timber-framed town house, and one of the finest examples of Elizabethan timber-framing in existence. This is the oldest building in Stafford, with a history reaching back into the twelfth century. St Chad’s is a gateway into the the past, and centuries of worship, but it also stands in the middle of a busy High Street, opposite Stafford’s finest hotel, The Swan. Our aim is to develop a ministry suited to the needs of the present – first and foremost by being a special place which is open to everyone. A memorial to the victims of the Katyn massacre was unveiled by Stefan Staniszewski, whose father Hillary Zygmunt Staniszewski (a high court judge) died in the massacre. 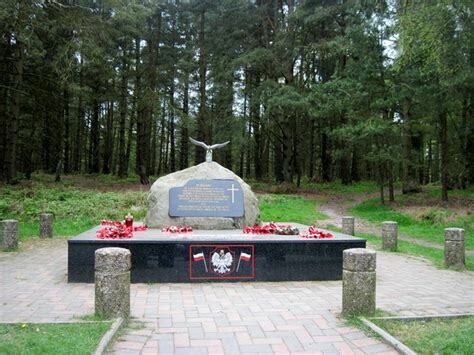 Preserved below the memorial are phials of soil from both Warsaw and the Katyn forest. Cannock Chase was designated as an AONB in 1958 because of its beautiful landscape, its wildlife and its history. Cannock Chase is the largest surviving area of lowland heathland in the Midlands. Lowland heath is an internationally scarce and threatened wildlife habitat. The AONB also has extensive areas of forest and woodland along with areas of designed parkland, sand and gravel quarrying and mixed agriculture. Cannock Chase and its associated animal and plant communities are part of an historic landscape dating back thousands of years. Wild deer still roam the Chase and are probably descended from the original herd introduced in Norman times for hunting purposes. Lichfield is a vibrant and historic city and district located in the heart of Staffordshire, just north of Birmingham. Lichfield's streets are lined with museums, independent shops, mouth-watering restaurants and luxury accommodation. Lichfield has a rich and varied history, with Georgian museums including the Samuel Johnson Birthplace and Erasmus Darwin House, through to the stunning medieval Lichfield Cathedral.